It’s a little-known fact that mixing rainwater and single-origin fair-trade coffee creates a potent creativity potion. I mean, that must be the reason that the Pacific Northwest is so rich in awesome comics and graphic novels! Here are just a few of my favorites, ranging from personal memoirs to sci-fi to noir thrillers. 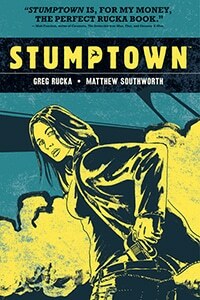 I loved the first two volumes of crime-noir series Stumptown, penned by Portland-based author Greg Rucka. Dex Parios (short for “Dexedrine,” yikes) is an ace private investigator and the can’t-win-for-losing owner of Stumptown Investigations. Unfortunately, her gambling habit has gotten her deeply in debt to the Confederated Tribes of the Wind Coast’s casino. Sue-Lynne, head of casino operations, is willing to scratch Dex’s debt if she can track down Sue-Lynne’s missing granddaughter, Charlotte. But the closer Dex comes to finding Charlotte, the more complicated the mystery gets. As her path crosses the Marenco crime syndicate again and again, the smart-mouthed sleuth wonders if she’s in over her head this time. This creepy horror story is guaranteed to make you squirm in your seat as you read. In 1970s Seattle, a strange disease has broken out among local teens. Transmitted by sexual contact and incurable, the plague takes many forms — everything from a tiny second mouth sprouting from your neck to full-on, grotesque disfigurement. The afflicted teens are shunned by society and end up in a homeless camp in the woods… and then they start disappearing. The story follows teens Chris and Keith as they are infected with “the Bug” and make their way to the camp in the woods. While the Bug is obviously a metaphor for AIDS, the story is also about the unpredictable and scary effects of adolescent sexuality and teenage social cliques. If you want to scare your kids away from sexual activity (possibly forever), hand them this book. 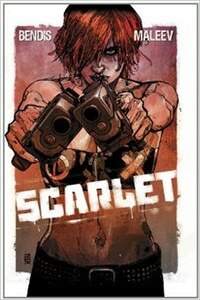 A fast-paced political adventure story with plenty of violence, Scarlet may not be for everyone with its in-your-face message about police corruption and lax government. Just two regular (if scruffy) Portland citizens, Scarlet and her boyfriend are hassled by a dirty cop who thinks they look like drug dealers, and when the confrontation escalates, Scarlet is shot and her boyfriend is killed. Far from being disciplined, the corrupt cop gets off scot-free and is even promoted. Utterly disillusioned about the justice system, Scarlet snaps, deciding to expose the corruption and eventually to foment revolution. Scarlet routinely breaks the fourth wall by addressing the reader directly, and the photo-realistic art (in a saturated red palette) can be a little overwhelming, but if you like its message, you’ll be counting down until Volume 2 is out in December 2014. 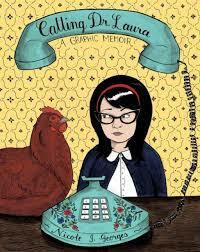 If you like graphic memoirs, and/or you were a Riot Grrl in the ‘90s, Calling Dr. Laura may lead to intense feelings of nostalgia. Nicole Georges grew up being told that her father had died of cancer when she was very young. As a young adult, a psychic informed her that her father was actually alive — and the psychic was right. Suddenly questioning everything she remembers about her chaotic, abusive childhood and her difficult relationship with her mother, Nicole decides she must unravel the mystery of her origins, however painful. While it superficially resembles Alison Bechdel’s work — lesbian cartoonist writes about complex parent-child relationships — Georges’ style is more openly emotional, drawing parallels between the deep insecurity she felt as a child and her adult behaviors and relationship patterns. 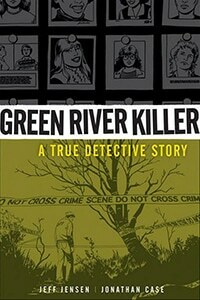 The story is set in Portland, and the sense of time and place feel spot-on. 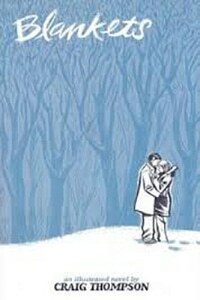 One of the best-known personal memoir graphic novels, award-winning artist Craig Thompson’s Blankets is probably already familiar to comics fans (I’m cheating a bit here, as the memoir is set in the Midwest, but Thompson is currently a Portland resident). Thompson tells the story of his difficult childhood, bullied by cruel classmates because of his family’s rigidly fundamentalist Christianity. His strict, authoritarian parents discourage his artistic creativity as sinful and force-feed him religious doctrine until high school, when he meets the emotionally open and spiritually accepting Raina at a religious camp. Their friendship blossoms into young love and builds a bridge for Thompson’s self-acceptance and independence from his family’s teachings. The sensitively rendered black-and-white line drawings are lovely to look at and well suited to the tender, emotional story. 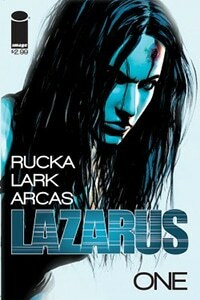 Another fairly new series from Portland writer Greg Rucka, Lazarus only has two trade paperbacks currently out. But this sci-fi dystopian adventure is already off to a rip-roaring start. In its near-future feudal society, government has collapsed and power is held by a few Families, who exploit the labor of the little people, aka the “Waste.” Each Family has a genetically enhanced super-soldier called a Lazarus, both for protection and to do their dirty work as a professional hitman. Forever “Eve” Carlyle is the Carlyle family’s Lazarus, but ironically, she seems to have a softer heart and more personal ethics than her double-crossing, amoral, endlessly scheming family. The complex betrayals and shifting alliances of the Carlyle family, and some pretty intense world-building, are the focus of this first volume, so you can expect the action to pick up quickly in forthcoming books. This groundbreaking series by Seattle author G. Willow Wilson is so new it doesn’t yet have a trade paperback complication, but it’s coming in December. 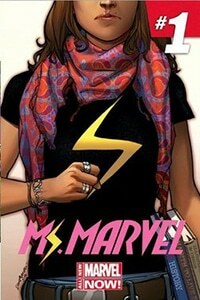 Kamala Khan is a teenage Muslim girl from New Jersey who suddenly develops shape-shifting powers; deciding to become a superhero, she takes on the name formerly used by her favorite Avenger, Carol Danvers. Yet her first great struggle is against herself — learning to understand and use her powers, figuring out how this fits in the framework of her conservative Pakistani family, and contending with all the normal drama that any teen faces. The “superhero” metaphor is a symbol for the struggle of immigrant-born Americans straddling the expectations and rules of two often diametrically opposed cultures. Ms. Marvel is the first Muslim character to have her own series, and we’re looking forward to seeing what Wilson does with this title. Did I miss your favorite? Tell me in the comments!